Robotic and computer-assisted technology are increasingly being developed for their use in endovascular surgery to aid surgeons in providing higher precision and increased accuracy. However, certain challenges, such as the limited workspace and the potential for collision between the robot and surrounding obstacles, are important aspects that need to be considered. At the Surgical Robotics Laboratory, we have developed a magnetic actuation system, called the Advanced Robotics for Magnetic Manipulation (ARMM) system to assist clinicians with the magnetic actuation of endovascular catheters. The ARMM system, furthermore, incorporates advantages of both having a 6 DOF serial-link actuator, as well as an electromagnet for magnetic actuation of surgical instruments. Endovascular Aortic Repair (EVAR) is the most common technique to repair abdominal aortic aneurysm. Magnetic resonance (MR) images have major advantages over the conventional X-ray image guidance. However, the promise of endovascular MR image-guided procedures remains unrealized in part because of the challenge of developing an MR-compatible steerable catheter. 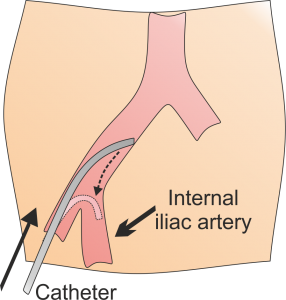 One of the goals of this project is to develop a steerable catheter that can operate within the MR scanner using magnetic actuation techniques.